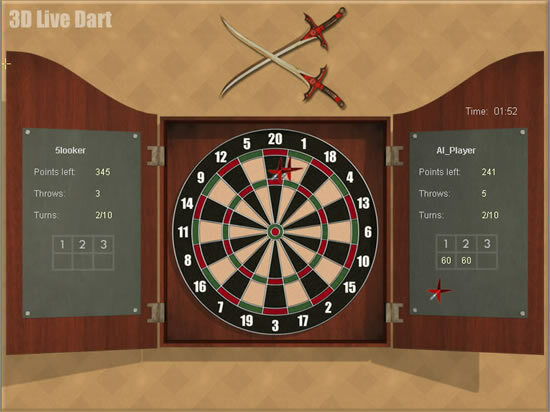 2D/3D Live Dart is developed for Dart fans.In this game, you can compete with real players all over the world or watch other games in progress. Play in the practice mode if you want to play with the computer. The ELO rating system is introduced in this game. You'll get rate points just as professional dart players do in real world. Prized dart tournament is held every day. It features polished 2D/3D graphics and realistic sound effect. 2D/3D Live Dart is developed for Dart fans. 2.When the aim circle becomes smallest, press left button and hold. When the aim circle becomes smallest again, release the button to throw the dart. Smaller the aim circle you make, the more accurately you'll shoot. 3.Right click mouse if you want to cancel the selected aim circle. The red circle in the middle, made of hard wood, is called bulls eye and worth 50 points. It counts as a double. The four green fields surround bulls eye are worth 25 points. The numbers 1 through 20 placed around the board are nominal values for darts hitting the respective fields or sectors. The two larger fields of a sector (green for the 20 sector) are worth their nominal value as denoted by the number ring rounding the board. The outer thin ring closest to the actual numbers are doubles, and worth double the nominal value of their sector. 3d live pool is a comprehensive pool game with full 3d environment. Screen Saver. Shows on a screen short phrases. The phrases can be changed. Qweas is providing links to 3D Live Dart 1.087 as a courtesy, and makes no representations regarding 3D Live Dart or any other applications or any information related thereto. Any questions, complaints or claims regarding this application 3D Live Dart 1.087 must be directed to the appropriate software vendor. You may click the publisher link of 3D Live Dart on the top of this page to get more details about the vendor.